The word filigree comes from the Latin word filum meaning thread and gramum meaning grain. Quilling is most likely inspired by mettle filigree. Filigree is the art of shaping silver and gold and other types of mettles that are made into wire then they are rolled into rolls and scrolls. Paper was a lot less expensive and could be made into the same shapes of the mettle. Paper then became the way that common people could practice the art of filigree. To help paper look like mettle filigree the paper is some times guided. The art of filigree originated in ancient time’s examples of this early work can be found on Egyptian, Greek, and Etruscan tombs. About 1700 is when the name of this remarkable craft changed from paper filigree to quilling. It is believed that quilling was discovered by nuns or monks in monasteries in the 1500’s while working on illuminated manuscripts, these nuns and monks kept the secret of there work until the 18th or 19th century when quilling became an art for fashionable lady’s to practice. Many women in the upper and middle class started practicing this art and became quite skilled in it just like the art of embroidery. Most evidence of the start of quilling points the origin of it to the Mediterranean aria. Possibly as early as the 13thcentury in Italy members of different monastic orders they began to use paper filigree. Early quilling resembles Byzantine art very much. When the Byzantine Empire was concurred the arts of the time that did filigree and mosaic art fled north and that is how it is believed that it migrated north to Europe. Quilling history also closely follows the history of paper witch was invented in china and spread west from there. There is a theory that quill work was used to decorate early churches. Quilling first got its name because the quills of feathers were used to rap the paper around. Most quill work that is in the museums dates back to the eighteenth or nineteenth century but historians believe that it started before that. In the 18th and 19th centuries paper became massed produced and more widely used, also it started to cost less to buy. Quilling that was done in the early years has a rough (uneven) edge because it was all hand cut for no two cuttings are ever alike and no one cuts perfectly strait. Very little early work survives to day because of the fragile nature of this art. Quilling flurried especially in France and Italy during the 17th and 18th centuries. In the 17th century quilling was some times used to decorate the walls of housed instead of the more costly paintings of the time. Quilling crossed the sea and also found a home in America manly in the New England aria. It became so popular in America some boarding schools advertised that they teach quill work as part of the curriculum. In early colonial times paper was rare and never wasted it is most likely that all the quilling was done with used paper. In the US most of the surviving quill work is in the form of sconces (these are wall hangings that hold candles). 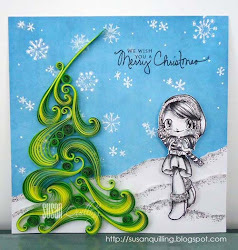 Quilling can also be as easy or as difficult as you the artist would like it to be. Quilling is just beginning its modern day revival. New ways, patterns, styles, and uses for this versatile art are being devised the history of this great art form is still being written. Along with filigree, quilling resembles mosaic arts. Mosaics are formed by putting small pieces of marble, glass, colored stones, tile or other small materials. These are all laid in cement or other mixture to hold the small pieces in place. These small pieces form a picture or design. Quilling designs and patterns can be easily exchanged for mosaic patterns and designs also different types of embroidery patterns and designs. Quilling can be an inexpensive craft for anyone to try. Today we have lots of specialty paper that is machine cut and tools to help us quillers do are job faster and neater. Quilling also has a strong resemblance to lace. Everything in this BLOG: Photograph, Creation and Text are Personal Owned/ Private Property and COPYRIGHT of SUSAN QUILLING CARDS. If Anybody needs to Use My Creations, Please Get My Permission by Sending Written Request in Advance. . . my crafty corner . .